"Tommy Gee has communicated the April challenge. It's a straightforward 1500 meters with no stroke restrictions." Very nice, simple, and inclusive. Would love to see a big Free Spirits entry for this one. Maybe a go today...do we float 7 boats this month ? Wanted to do only three 6 minute intervals today and thought this might fit in well as the middle one. Divided it in 6 splits, my goal was to start at a 1:55 pace and go a second faster every split. Felton, tough one, but a good start to a new month! But how much is saved for when I have to go again? Not much more here, but I can foresee something in the lower 5.20s on a good day. At first I had the intention to try and make it to boat 1 today, but my legs (and the rest of my body) felt a bit tired so I decided to start a bit slower then I had in mind. I am glad I did, because it was struggling to get to the finishline. I think I will feel better later this month, so I think this isn't my last attempt. Though I guess boat 1 will be out of reach by then... Never mind, I settle for anything as long as I feel ok with my rowing. 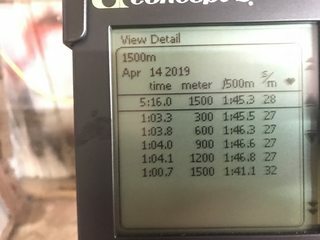 First attempt at a CTC and race for Free Spirit Rowing, hopefully will improve it over the month. Welcome to Free Spirits Ben and thank you for joining us with your baptism of fire with an almost perfect "fly n die" 1500m. That was a brave effort but I think you should maybe start at 1:46 (or even a little slower) and then see what's left for the last few hundred and empty the tanks at the end rather than the first 300 (although that last 300 shows a good recovery). As Felton wrote in the other thread this is a very competitive first entry, and with Plummy’s advice I am sure you can go even faster. Did you see the beginners thread started by Zoot in the Forum? I cannot find the link but definitely a good thread to read for new members. How do I register a CTC account ? Nice work, Tako. I look forward to coming up half a second short of you again . Hi PaulC (and welcome to the forum). If you go to the blue bar at the top of this page and click on the "Links" tab, a drop-down will appear which includes a link to the CTC. Click on that and towrads the top right of the CTC page you will see a red text header that says "Add or update a person". Hopefully, it should be straight forward from there. Thanks for the nice target Steve I had three attempts so far, the best being 5:31.5 last night, which I'm still fairly disappointed with. 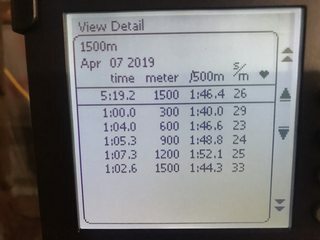 After the March ctc I hoped to do better than this but maybe my cold isn't fully gone and I returned back to hard erging too soon. Did a 1000m tt last week trying to get a feel for this one. Pace for the 1k was 1:41.9..that predicts a 1500m of 1:44-1:45. I felt that was doable. Plan was to go out semi hard, then steady pace til 500m then empty the tanks. Pretty much a max effort. Maybe more in a couple weeks? Will have another go next weekend, hopefully take couple sec more off. That's very nicely paced - great effort Ben. I agree with your thinking that there's another couple of seconds more in the tank. Maybe try and hold 1:45 for the first 1,000 and see what's left. You'll have a couple of seconds in the tank if (ha! "if". more like "when") it gets nasty. Another go today. Wanted to have a negative split but the beginning went (too) easy. Slowed down a little in the middle, then a bit faster again, and in the end, well, glad I made it. Bought myself a new PM5 monitor and a heart rate monitor, so now I can keep an eye on my heart rate as well again. That's been a while so I haven't got a clue about my max or zones at the moment. Going away for a week next saturday, so I don't know whether I'll have another go when I come back, the last few days of April. This might just as well be it for this month. Still plenty of the month left Dave. Thanks for the overview Ian. Just saw a great effort being registered by Ange! Due the nature of the straight 1500m I hope to see many more entries coming in and float many more boats. Did think you might be beyond me, but set out with a 1:45 target and see what was left in the last 300.